I have some good and bad news about my hammock hang calculator for Android. This might be a longer post for a simple update, but I hope it is helpful to explain the bad news. First, let me be honest in saying that developing an app for Android is like herding cats: there are so many versions, so many hardware variations that it has been difficult to maintain. I have been very sensitive to the issues experienced by Android users of the app and we recently spent some time to fix the major bugs we are aware of. The Android version was recently updated to fix some lingering bugs and performance issues. The developer wasn’t able to update/replace the existing app in the Google Play Store and in the end we had to take down the app and republish it as a new app (slight name change). This was a very frustrating circumstance on many levels. Unfortunately, the Google Play Store wouldn’t let us set the app for free for a duration and then affix a price later. What this means is that what should be a free update to all existing customers now means a new purchase and download for everyone. Validate your original purchase (send the original purchase date* and the purchase postal code to support@codeality.com). We have started to build a third version of the app for both Android and iOS with more features and an even better user interface. I am very excited about the new design and can’t wait to get it published. This new version will also be a free update for all existing customers. However, for Android users, if you want to get v3 as a free update, you will need to upgrade to the latest app as described above. For questions related to the refund, please contact support@codeality.com. If you have any feature requests or input for the version now in development, please contact me at theultimatehang@gmail.com. *The developer cannot refund the purchase if it was before October 23, 2013 due to restrictions from the Google Play Store. The app looks good and I look forward to using it. I find the format of the clinometer to be confusing, however. 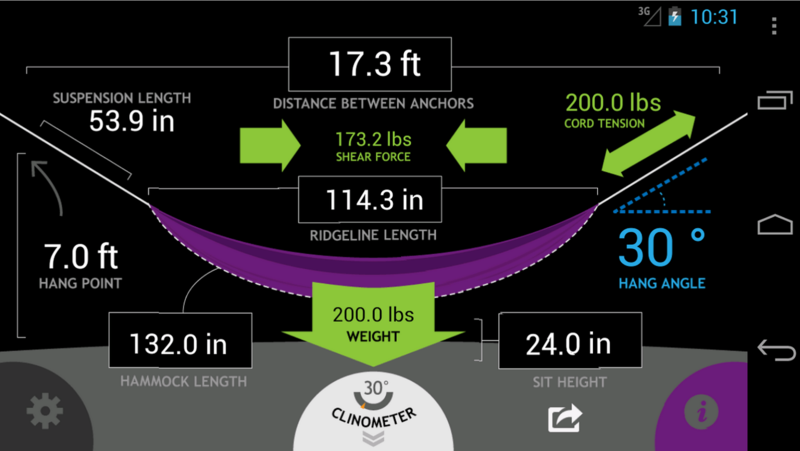 Like clinometers on crane booms or boats, the numbered scale should stay fixed while the arrow points to the angle of inclination as the phone rotates up. I suppose what I mean is that the scale seems to move paradoxically. The number comes out correct. I think I’m expecting that the virtual plumb bob should stay vertical while the scale should stay aligned with the phone. getting an iPhone is a big ask for lots of people. I’ve been an apple guy since jobs came out with the colorful iMacs and iPhone isn’t perfect but the hang calculator works perfectly on my iPhone. That you’d have to rename the app on android store is really really lame. Will this be available on the Amazon App Store? How in the name of God’s Holy Trousers am I supposed to know the original purchase date? I mean it’s only two bucks, but it’s a bit disappointing. It should be in an email receipt you got from Google. I just emailed you but I’m not sure how frequently you check the corresponding email. The app is a great idea (and works great) but I think could use some TLC in GUI and some of the ease of use areas. I’d love to volunteer to work with you (and/or your developer if its someone else) to iron out any of the kinks. I did receive your email. I’ll respond there thanks for reaching out! I agree! Working on it. What is the name of the Updated The Ultimate hand app for android? Only thing I found was hammock tools and it doesn’t let me past the first section . Grrrr. Got a new phone Galaxy s8 and want the app on my phone. Please advise and help. I regret that I had to take down the app a few months ago because the app was breaking on too many devices. It’s been very difficult to keep up with all the varying screen sizes so we decided the best option was to pull down the app and re-code it from the ground up using a different platform. The process is underway, but we’re doing it on our free time, which means it will take a few months to hammer out.